The awards recognized the outstanding contributions and achievements of 17 governments, business organizations, and individuals who have raised the benchmark of people strategy in the region, across 15 categories at this high level, by-invitation-only gathering. Abu Dhabi, United Arab Emirates, October 29, 2018; Held alongside the 6th Annual GOV HR Summit, organized by QnA International, at the Jumeriah at Ethiad Towers, the second day witnessed the region’s most prestigious and coveted award ceremony. The GCC GOV HR Awards 2018 highlighted, honored and celebrated path breaking achievements of public & private sector organizations and individuals who have demonstrated exemplary leadership towards driving organizational and team effectiveness through Human Capital Management, Diversity and Strategic Planning. “The GCC GOV HR Awards 2018 created to support the vision of the most prudent leaders of the region witnessed a wide scale regional participation from organizations in the government and private sector, and individuals which was judged by an esteemed panel of judges comprising of independent experts, analysts, HR experts, journalists, and academicians. 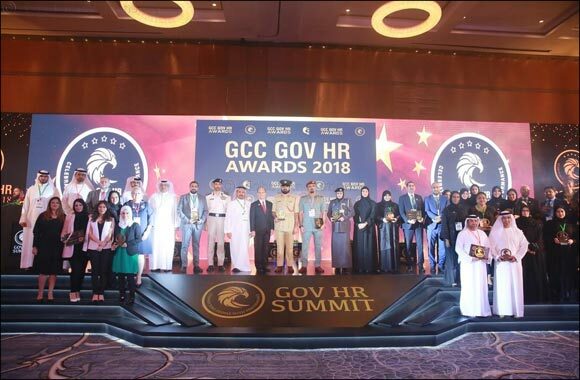 Gender equality, youth empowerment, women leadership, nationalization and HR Technology were at the forefront at this year’s GCC GOV HR Awards. 17 brilliant initiatives were recognized for their outstanding contribution in Human Resources excelling in people strategy from across the GCC for highlighting best practices, unparalleled networking opportunities and reinventing the role of HR.’’ said Mr Ackash Jain, Director, QnA International. The GCC GOV HR Awards 2018 focused on building and working towards a progressive sustainable knowledge-based economy with human resources as its backbone.